Ivy is common climbing shrub found throughout Ireland, its attractive green foliage carpeting the façade of old buildings, stone walls and trees. Many climbing plants support themselves by entwining themselves around the supporting structure, but Ivy is different. It attaches itself to the substrate directly using short, sucker-like aerial “roots” that adhere firmly to any surface and provide support for the plant. Anyone who has tried to trim a well established ivy plant will be well aware of just how effective this method of attachment can be. Although it is a very versatile plant and can grow well in a wide variety of conditions, ivy tends to thrive best in rich, moist soil which can be either acid or alkaline. It is very shade tolerant and grows well even if completely shaded by overhanging trees. Ivy is rooted into the ground and gets its water, minerals and nutrients through these ground roots in the normal way. The small aerial roots are used primarily for attachment, and unlike some other plants, such as mistletoe, ivy does not plunder nutrients from trees that it is attached to. Indeed, contrary to popular belief ivy rarely does any damage to trees, walls or buildings: the only real risk is from the additional weight of sometimes rampant ivy, and for healthy trees and sound walls that presents relatively few problems. In the absence of a suitable climbing surface ivy will readily sprawl to cover the ground around where it grows, and often carpets large areas of woodland floor. This habit of sprawling has been exploited by gardeners for centuries, and ivy is frequently used to conceal bare areas of ground or to disguise unsightly structures in the garden with its luxuriant evergreen foliage. It is easy to grow, can be readily trained into almost any shape and can be clipped as required. As well as the original wild variety there are many decorative hybrids that have been developed specifically for the garden. The evergreen foliage doesn’t just look attractive: ivy is an invaluable plant for wildlife as well. It provides excellent cover for nesting birds and all sorts of dark nooks and crannies in which countless invertebrates take refuge. Ivy flowers in the autumn, and provides a rich source of late nectar to many beneficial insects like hoverflies and bees. In the depths of winter when other food is scarce the swollen black berries of the ivy ripen, providing welcome bounty for birds like woodpigeons, thrushes, robins and black-caps. The dainty holly blue butterfly relies heavily on ivy for a significant portion of its life-cycle. As well as providing a source of nectar for towards the end of their lives this is the primary food plant for the butterfly’s summer brood of caterpillars and provides cover for the over-wintering chrysalides that will emerge as new adults the following spring. There are references to Ivy throughout human history. It was revered by the ancients, and formed not only the “poets crown” but also the wreath of the Greek god of wine, Dionysus. The ancient Greeks held the belief that binding the forehead with ivy leaves would ward off the effects of inebriation. Greek priests often presented wreaths of ivy to newlyweds and it has traditionally been regarded as a symbol of fidelity and friendship. 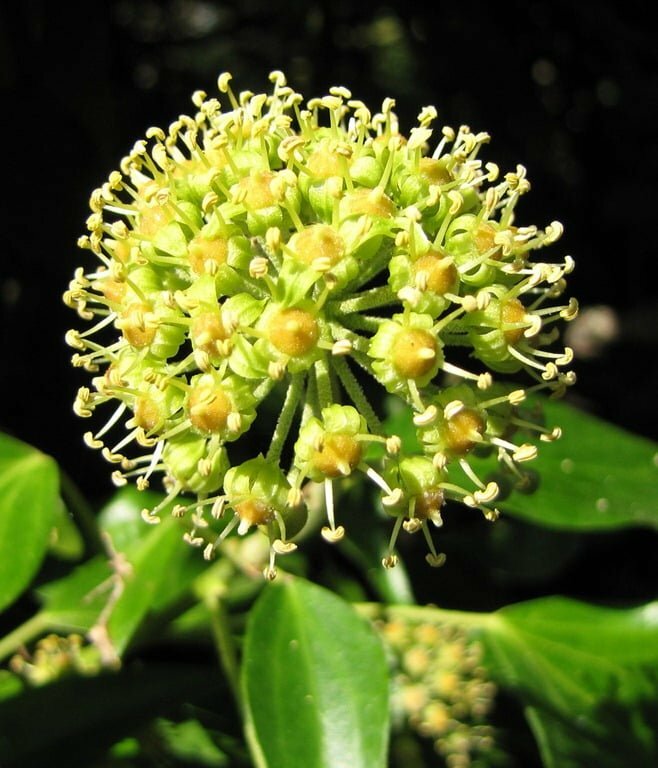 Herbalists have used remedies derived from ivy leaf to treat a range of complaints, including bronchitis, whooping cough, arthritis, rheumatism, and dysentery. Extracts of the herb were also applied externally to treat lice, scabies and sunburn, while the the black berries were said to cure jaundice, kill intestinal worms and even prevent the plague.